Dark hydrocarbon seas and light methane clouds are visible in this image of the Saturn moon Titan's northern reaches captured by NASA's Cassini probe on June 9, 2017. Methane clouds cruise above hydrocarbon seas in a gorgeous new photo of the huge Saturn moon Titan captured by NASA's Cassini spacecraft. At 3,200 miles wide (5,150 km), Titan is the second-largest moon in the solar system, behind the Jovian satellite Ganymede. 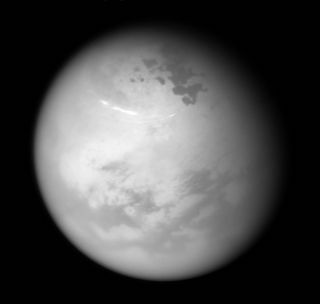 Titan has a thick, nitrogen-dominated atmosphere and a hydrocarbon-based weather system: Liquid ethane and methane rain from the skies, flow in rivers and collect in seas and large lakes. Indeed, Titan is the only object in the solar system besides Earth known to host stable bodies of liquid on its surface. The $3.2 billion Cassini-Huygens mission — a joint effort of NASA, the European Space Agency and the Italian Space Agency — launched in 1997 and arrived in the Saturn system in 2004. The Cassini mothership carried a piggyback lander called Huygens, which successfully touched down on Titan in January 2005. The orbiter, meanwhile, continued circling Saturn, studying the giant planet, its iconic rings and many moons. But that work is nearly done. In April, Cassini made the first of 22 "Grand Finale" dives between Saturn's cloud tops and its innermost ring. These plunges will continue for several more months; then, on Sept. 15, the spacecraft will barrel into Saturn in an intentional death dive. This maneuver is designed to ensure that Cassini doesn't contaminate Titan or fellow Saturn moon Enceladus — both of which might be capable of supporting life — with microbes from Earth, NASA officials have said.